Damnit, I can’t help myself. First off, let me say I met Dr. John Gray years ago and I absolutely loved the guy. I had VIP guest seating at some MLM event where he was speaking and who’s sitting on my left? The Mars/Venus dude himself. I walked away with nothing but admiration and affection for the guy, and none of the words I’m about to utter will change any of that. 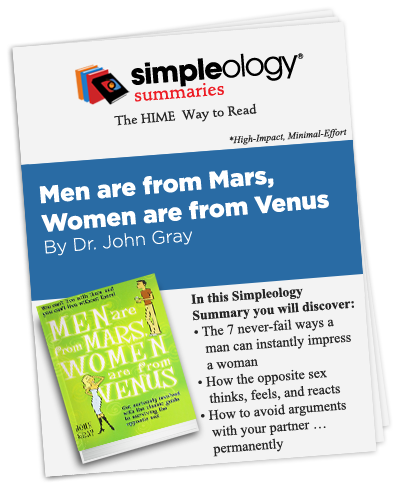 Anyway … a few months ago I asked my team to summarize Men are from Mars, Women are From Venus. Hell, it was the bestselling book of the entire 1990′s. I figured there must be some gold in there from which the Simpleology clan could benefit. Frankly, I didn’t know what to think. I was greatly conflicted. So, down the rabbit hole I went … Fortunately for me, I’m in a position where I can get first or second degree access to just about any expert on any topic. Among those connections are quite a few “dating gurus” who all went to work on getting my mind prepared for dating again. I must admit … what I discovered in that process changed me radically. Since then, I’ve come to the realization that just about everything I learned about “what women want” was not just wrong … it was disastrously wrong. See, what I read in the lovely Dr. Gray’s book was pretty much – word for word – what I believed would make a woman love you. Now? Well, I think that same advice, unless you combine it with other essential elements, will turn you into a beta male … you’ll be her girlfriend, not her lover … or worse, you’ll be the guy she uses while she secretly sleeps with men who are more alpha. Harsh words, I know. But often harsh realities require them. Now, don’t get me wrong. There are some great insights in the book. He shows you some fundamental differences between men and women that EVERYONE needs to understand. … this book will turn you into a hopeless “beta cuck” who is forever perplexed as to why his woman doesn’t truly respect him. Let’s discuss … My mind is open. Is yours? I think a healthy open discussion amongst the tribe here will help us all gain deeper understanding into what truly makes relationships work. After reading the summary, please chime in with your opinion. All comments are welcome. Guys, in this very personal 25 minute video I give you the most potent stuff I’ve learned in my journey. Stuff that, had I learned it years ago, would have saved me years of struggle and embarrassment. This video will be immediately available after you sign up for the FREE book summary above.